An artist and architect at heart, Dr. Frank DePaola knew that he possessed the innate talent to design and develop smiles that were not only beautiful, but also improved his patients’ overall oral health. Throughout his career, Dr. DePaola has developed a reputation for delivering exceptional quality dental restorations with an aesthetic sensibility. 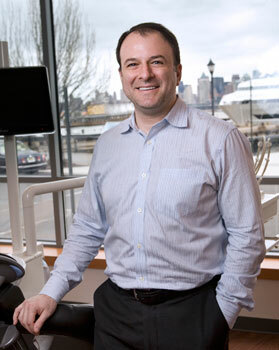 Dr. Frank is a graduate of NYU College of Dentistry and completed a General Practice Residency through Mt. Sinai Hospital. He came to Hoboken as an associate in an area practice immediately following the completion of his dental education, and opened his own private office in March 2000. In 2010, Dr. Frank opened his new 4200 sq. ft facility, The Practice at Maxwell Place, which is also home to his pediatric practice, Children’s Dentistry of Hoboken. A FELLOW of the Academy of General Dentistry (AGD), Dr. Frank has completed numerous course work at the prestigious Las Vegas Institute of Advanced Dental Studies. This neuromuscular dentist has received state-of-the-art cosmetic, smile design, TMJ disorder, and Sleep Medicine training since 2003. He is also a PREMIER-preferred Invisalign provider. He has extensive training and education in this field and is proud to also offer PROPEL Ortho which can accelerate treatment times for his invisalign case treatments. He is a member of the American Academy of Cosmetic Orthodontics (AACO). He is also a proud member of the American Dental Association (ADA) and the American Academy of Cosmetic Dentistry (AACD). Additional cosmetic and neuromuscular affiliations include the IACA and ICCMO. He has extensive experience in the treatment of sleep apnea and is a member of the AASM, American Academy of Sleep Medicine, and the, AADSM, American Academy of Dental Sleep Medicine. Dr. Frank is also a member of the AAFE, American Academy of Facial Esthetics, and is state-certified in Botox and Juvederm cosmetic therapies since 2007. Dr. DePaola has taken numerous courses at the prestigious Las Vegas Institute for Advanced Dental Studies (LVI), the premier neuromuscular and cosmetic dentistry training institution in the country. His ongoing studies at LVI will ultimately culminate in the achievement of his LVIM mastership. This training enables Dr. DePaola to deliver the best dental healthcare for his patients. Dr. DePaola received the Academy of General Dentistry’s 2012 Fellowship Award during the AGD 2012 Annual Meeting in Philadelphia. The Fellowship Award is presented to dentists who seek to provide the highest quality of dental care by remaining current in their profession. To accomplish this goal, Dr. DePaola completed over 500 hours of continuing dental education, passed a comprehensive examination, and has maintained membership in the AGD since 1999. Only 11% of all dentists have achieved this prestigious award. We are proud to announce that Dr. Frank was selected to be the CoverDoc for the prestigious industry publication, ‘The Progressive Dentist,’ – February 2015. Please contact The Practice at Maxwell Place using the form at the right side of the page or call 201-792-9400 today to schedule your initial consultation. Dr. Frank DePaola serves patients from Jersey City, Hoboken, and Hudson County, New Jersey.